May must be the month for me to have my sassy shoes on because the last few shirts that I've bought have been those with words. I know, I know. 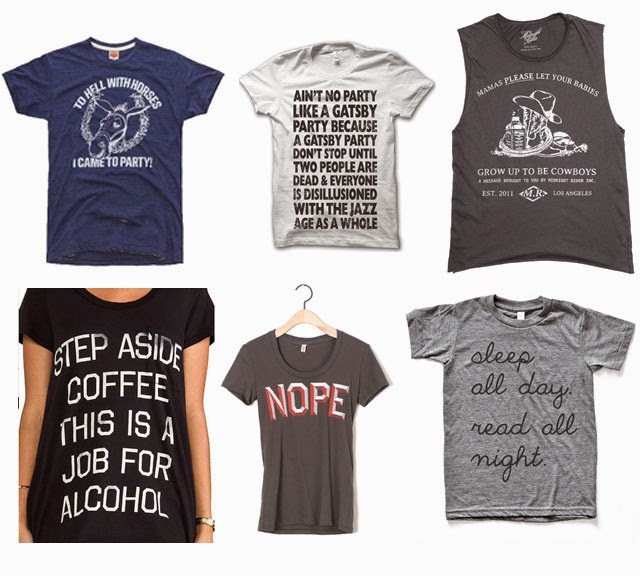 We've had many discussions about "how old is too old to wear shirts that say ____." I suppose the answer for me is "you're never too old." Because sometimes a facial expression isn't enough to communicate how you feel. All the time. To the world. Love the sleep/eat one. I don't think one's ever too old to wear that. Not the horse one...for reasons completely unrelated to age! Top left or top middle! lol! i love the coffee one and the nope one too. the gatsby one made me belt out a good laugh, too! Oh my gosh--- the Gatsby one! Yes! The Gatsby shirt is freaking hilarious!! Ha! I agree, you're never too old for a fun tee. These are all great. I legitimately just splurtted water all over myself reading that Gatsby one. Ha!! I've been thinking about DIY-ing some tshirts. The quality is crap but I don't have to pay over $20 for a shirt. Which one of these is your favorite, if I may ask? I'm partial to the Gatsby one...but I named my cat Gatsby so obviously I have a bit of an obsession.